So what makes it "Deluxe"? And 10 copies?sharing with friends? I think....but could be wrong....that it wasn't expected to be a mechanically new edition, so Deluxe was a better descriptor. But now that I have the PDF it's safe to say the game changed enough mechanically to qualify as the 8th edition of T&T. I think that French version that came out is considered to be 8e isn't it? I could be wrong. That was as hard to read for me as it was for you to write, Erik. I know we want them to succeed on this but you're just doing your job. Can't play favorites. I just hope the end of the month comes and they'll be shipping the books. I feel the same way. I have a high degree of confidence because of my knowledge of the folks behind this, most of whom were significant gaming industry figures to me in my formative years in the 80's, but as Erik has pointed out to me before most other people may not have any depth of familiarity with the people behind T&T or its peculiar publishing history....plus I'm only in this for "one of everything print related" at about $115 or so....Erik bought 11 copies fer gawdz sake!!! I'd be a bit more worried too with that much of an investment. I've always wanted to try T&T but never seen a copy. Well, Ken was at the printer's last month, so I'd be hopeful about the book shipping soon. I have no idea what his involvement with the KS is, though. Ken St. Andre is the principle author of the opening draft of DT&T and creator of T&T in general....but hsi involvement right now is minimal I think, since his part was writing and done a long time ago. I'm glad you wrote this. Frankly, I have found the rationales for extending this so often to be appalling. They just are high on their own fumes and believe that any delay they create is totally justified. This project got more and more bloated as it went along. The conceit evidenced by these people and their peculiar sense of entitlement is mind-boggling. My "degree of confidence" here remains veyr high. 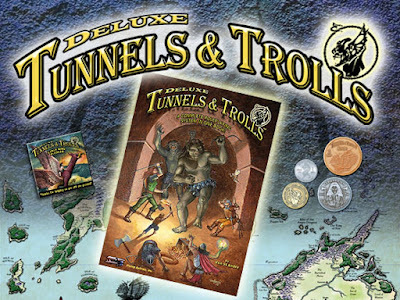 But if I find myself getting Primeval Thule for 5E on time this Nov/Dec and I still don't have my DT&T products in hand then I will have to concede defeat. The rulebook is back from the printer and shipping commences on monday! So don't fret, the long wait is coming to an end and you will be getting the rule books as quickly as we can ship them. I'm quite excited about this and look forward to seeing the book. Thanks for the progress report Steve. I am disgruntled that it has taken so long for this project to see completion. I still look forward to getting my hard copies. From the pdf it looks to be "deluxe" indeed. Vastly expanded material on Trollworld, more rules and play options, more art, and a colour tip in section. Plus a hardcover option.